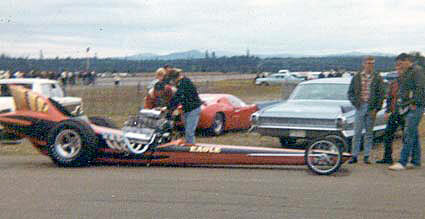 The Eagle Electric AA/FD made its 1966 debut at Sheldon Dragway. Driven by Frank Rupert the car ran almost exclusively in the northwest. 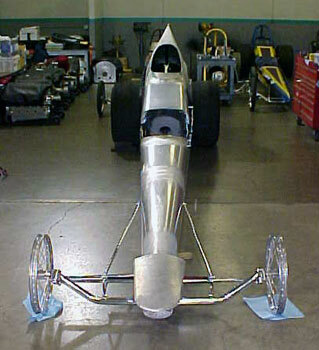 All finances, including building the car was from David Herensberger, owner of Eagle Electric and Plumbing, (Spokane). 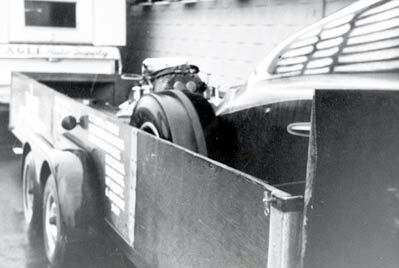 John Mead ran the car - was the engine wizard, etc. When Herensberger merged his company with the Pay 'N' Pac hardware chain in Bellevue, WA. he quit the racing program for a little while to concentrate on business. 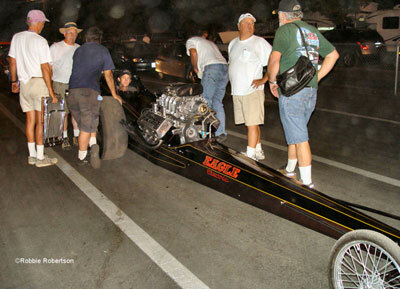 Mead kept the car and parts but it never saw another run down a drag strip. 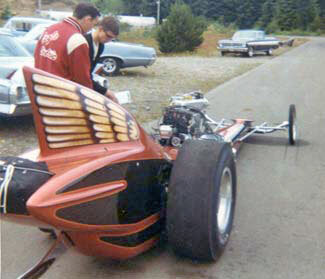 It was sold and passed around the Northwest until Bucky Austin found pieces of it in early 2005.
Who else but Tom Hanna (above in 1966) could have create the one-of-a-kind body the "Eagle Electric" AA/FD sported. All he had to work with was a concept drawing given to him by David Herensberger. According to Hanna, "It was big. It was ugly. And it was difficult. But it was exactly like the picture, and that's all that counted." Love it or hate it, the Eagle Electric car (Woody chassis) was a prime attraction in 1966. 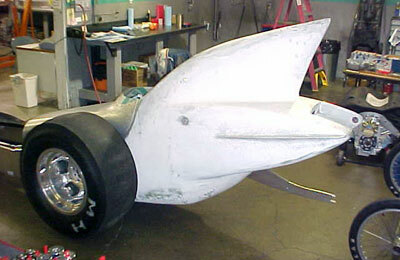 The car ran with and without the massive tail piece and its best runs were recorded without it. 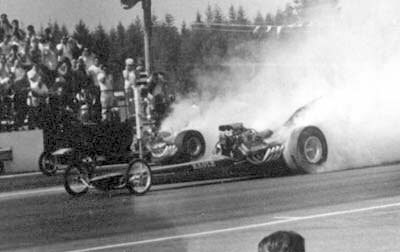 Frank Rupert in the Eagle Electric fueler is out on Rich Rogers in the Norton Bros. car at Puyallup in 1966. The unique "Eagle Electric" AA/FD sits in its state-of-the-art trailer in 1967. No matter how beautifully finished it may have been, a race car was just an implement and few received little if any protection from the elements. 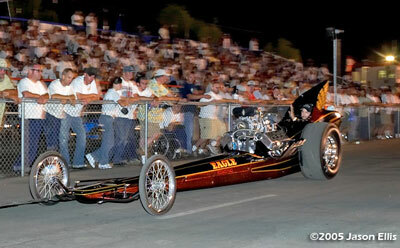 Bucky Austin is no stranger to drag racing. He started his career in 1956 as a spectator, then when he was old enough he raced with his brother Walt Austin. 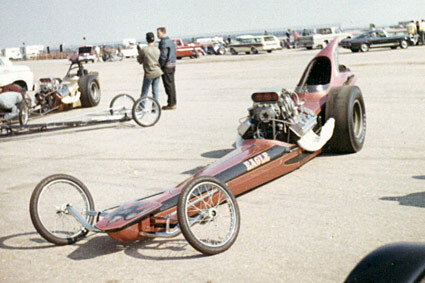 He got his own car in 1968, a Top Gas Dragster. He raced sporadically in the early years and then moved into the Pro Comp classes. 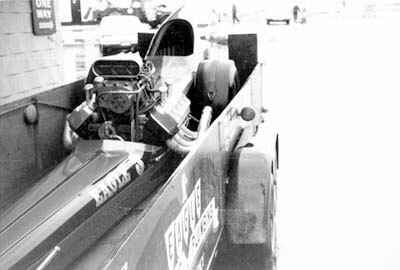 From 1974-1981 he raced FE injected nitro and then blown alcohol rear engined dragsters. 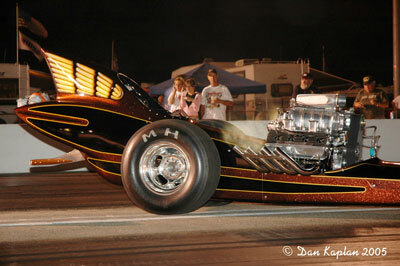 He moved into the Funny Cars, a class that suited his fiery attitude. 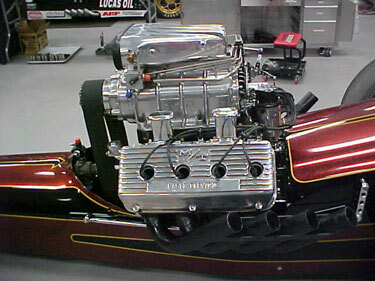 He cut his teeth not only racing the NHRA but also in the AHRA at Seattle and Spokane, Washington. Starting with his Bucky's Muffler Shop, over the years Austin has parlayed his automotive expertise into 18 Bucky's Complete Auto Repair locations in the Seattle area. His success has allowed Austin to not only keep racing on a national level but invest in some "toys". 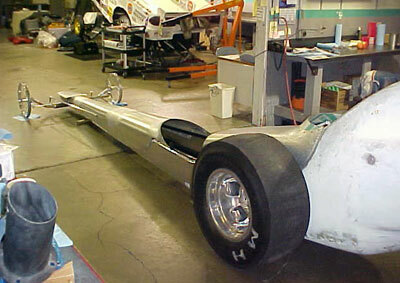 His first restoration was his "Northwest Hitter" Top Gas dragster. 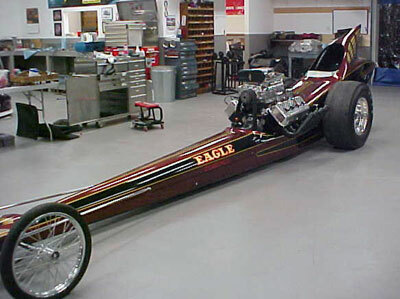 He then found the roll cage and tail piece of the Eagle Electric top fuel dragster and decided that would be his next project. 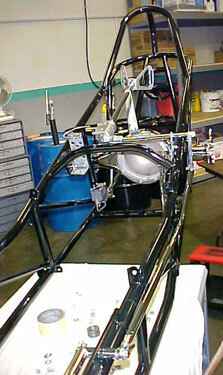 The restoration (more so a recreation) took place in-house at Austin's massive race shop in Tacoma, Washington. 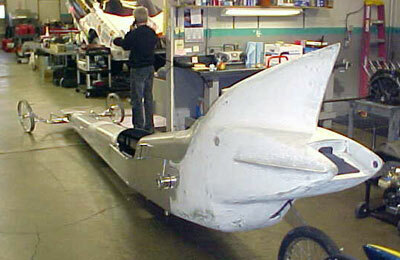 We pick up the restoration after the body panels had been repaired or replaced. 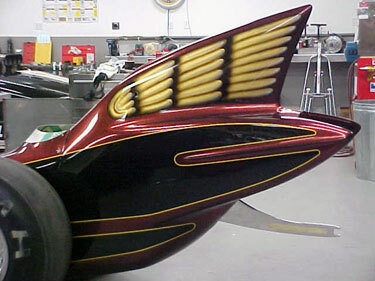 Besides the massive tail piece, the other unique feature on the Eagle car was the "arrow head" (aka Platypus) nose. 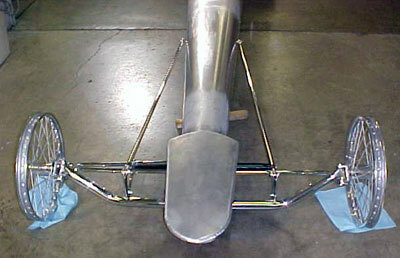 The original tail piece fitted to the original cage. 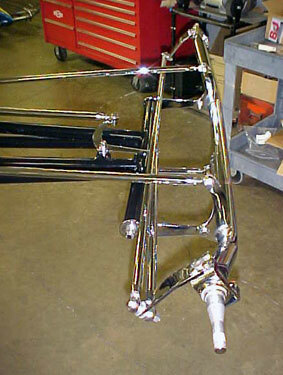 Once the body was fitted and finished the chassis was painted, the applicable parts polished and chromed and controls mounted. With everything painted and assembled for the first time, the car was magnificent. 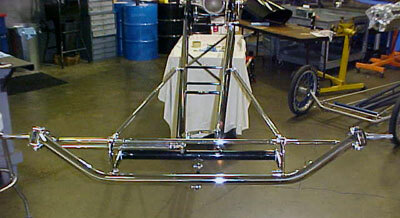 Note the push bar designed to clear the massive tail section. 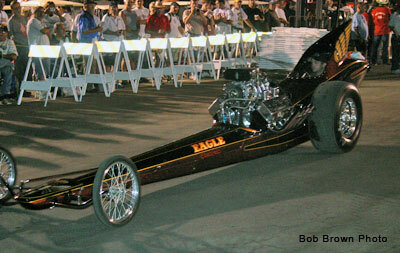 Just a note: The Eagle Electric car was originally painted by George Cerny Jr in Compton, CA for Dave Herensberger. 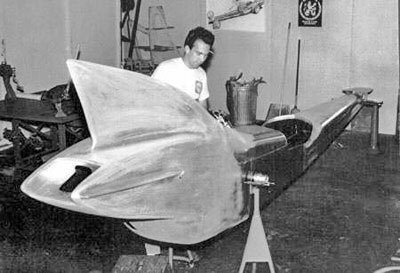 At the same time Herensberger was racing an unlimited hydroplane called Miss Eagle Electric that Cerny had painted earlier. 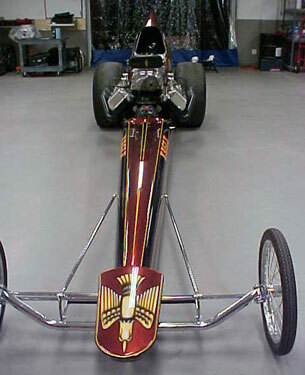 The boat and dragster paint jobs mirrored each other. 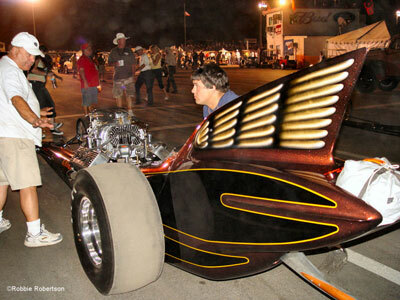 The big feathers on the back of the dragster were also done on the back tail fin on the hydro. Also on the hydro there was a huge, probably 5 ft across, gold leaf eagle on the nose. Both paint jobs were pretty amazing. At the onset Cerny's didn't want to paint the hydro as it wouldn't fit inside their paint shop. So Herensberger, at his expense, had Cerny Sr modify the building so he could put it inside and paint it. 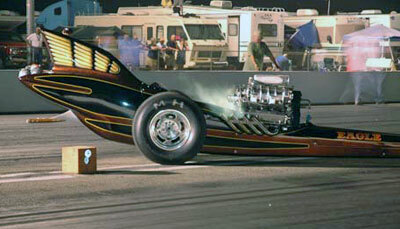 This was a real exciting time in drag racing. All the cars and people coming into Cerny's was amazing. 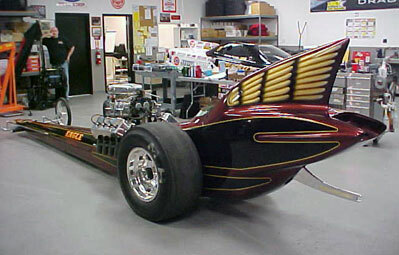 The car was first seen by the public during the Goodguys 1st Northwest Nationals in September of 2005. 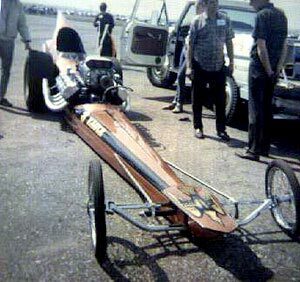 Along with the Eagle Electric fueler Austin also made the official Cacklefest debuts of two other restorations... his Top Gas dragster and Jerry Ruth's 1969 Don Long car. 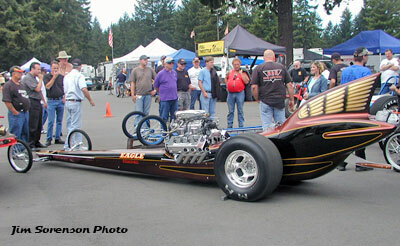 Here is the Eagle car in the staging lanes prior to the Cacklefest Parade. Austin crew member, Matt Mahoney got the seat for the cars first Cacklefest. The car put on a great show throughout its first big dance. It will be back for a long time to come.